The G6PD test checks your G6PD blood level. 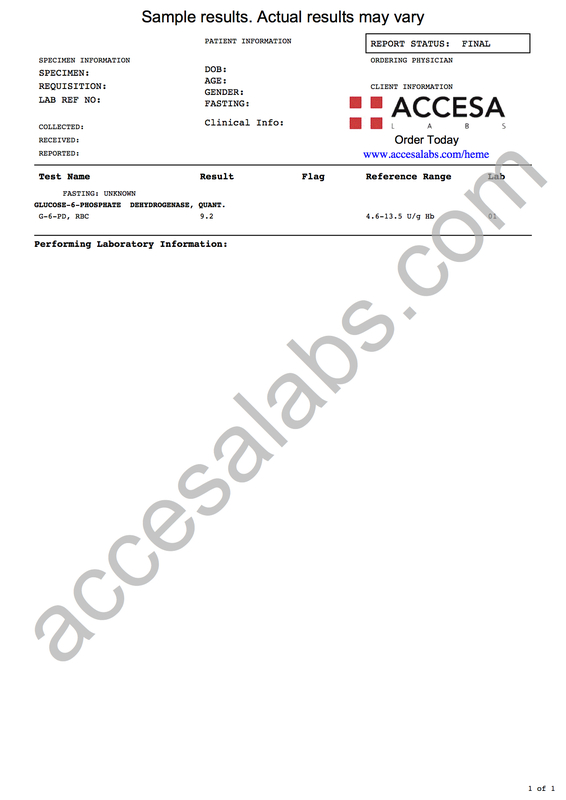 This G6PD lab test can help identify a glucose-6-phosphate dehydrogenase deficiency. What is a G6PD test? A G6PD test will help identify a G6PD deficiency in the blood. Why is a G6PD blood test important? The G6PD deficiency test is important for Peace Corps clearance and for screening in certain ethic populations. This G6PD Test is a blood test. The G6PD test, also known as a G6PD lab test, G6PD deficiency test and glucose-6-phosphate dehydrogenase test, measures the G6PD blood level. A G6PD, or glucose-6-phosphate dehydrogenase, deficiency is a genetic (inherited) condition found in people of African or Mediterranean descent. G6PD is an enzyme that plays an important role in red blood cells. While most people with G6PD deficiencies have no symptoms, specific crises can be triggered by environmental stimuli. More specifically, exposure to different types of foods (e.g. fava bean which causes favism), medications, or illness in a person with a G6PD deficiency can lead to red blood cell destruction (hemolysis) and life-threatening symptoms. G6PD deficiencies are typically diagnosed after a trigger causes a hemolytic event that leads to jaundice (yellowing of the skin) and anemia. There is no available treatment for G6PD deficiencies other than avoiding triggers. Given the issues that having a G6PD deficiency can cause, some people order it for general screening while others order it along with the Peace Corps lab test panel because they need it for their application. To get a G6PD test near you, order online and get your blood drawn at the Quest Diagnostics lab that you selected. Once the G6PD lab report is ready, it will be available for download. As can be seen on the G6PD sample report provided above, a numerical result will be reported in U/g Hb. The G6PD lab result can then be compared against the reference range provided by the lab. Given it's relationship to red blood cells, the G6PD test is sometimes ordered with the CBC test or the anemia test panel for more detailed screening. G6PD Test at Guaranteed Prices.